VITRIN is the brainchild of Zoltán Orbán and Krisztián Szetei, founders of the Solinfo design dealership and Dóra Fónagy, a Budapest-based designer and architect. 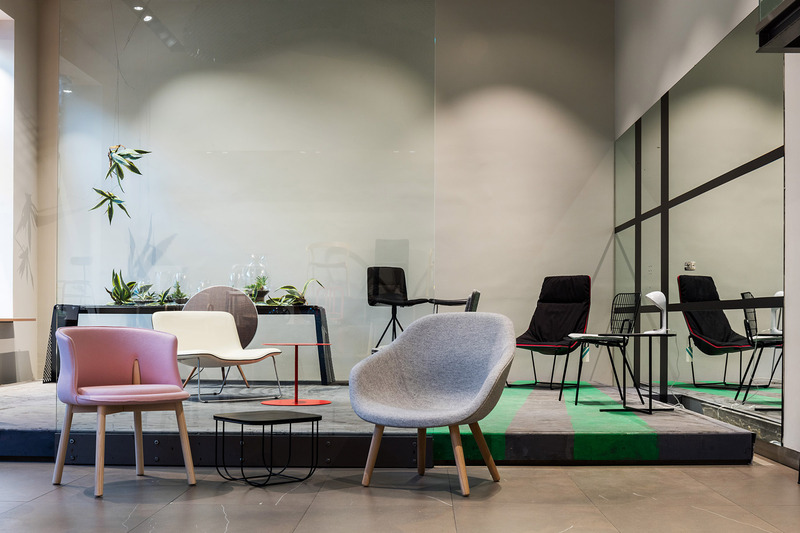 Having been in the design business for more than two decades, the founders envisioned a store that would not only sell furniture and accessories, but also serve as an exhibition space and workshop for design professionals. 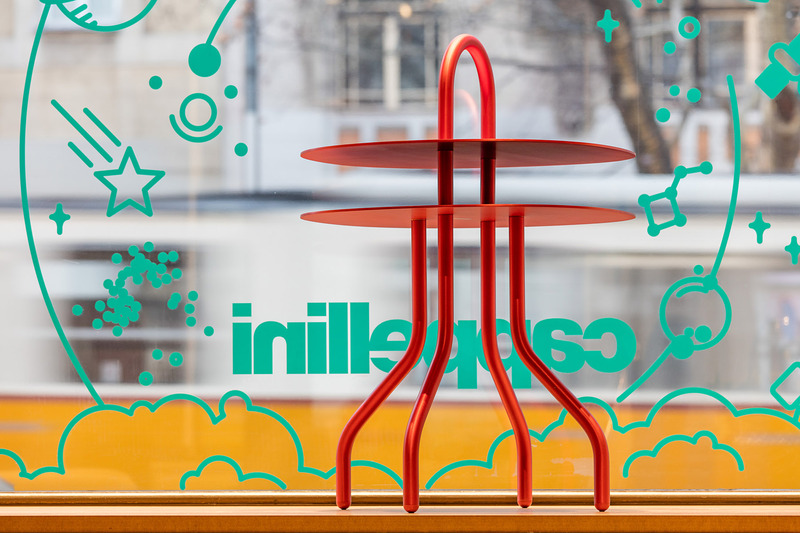 The store is situated on the ground floor of a 4-story house on Budapest’s Bartók Béla Boulevard, one of the premiere areas for art and design in the Hungarian capital. The large floor-to-ceiling height allowed the designer to create a 2-story loft space inside, lending itself to several functions at once. 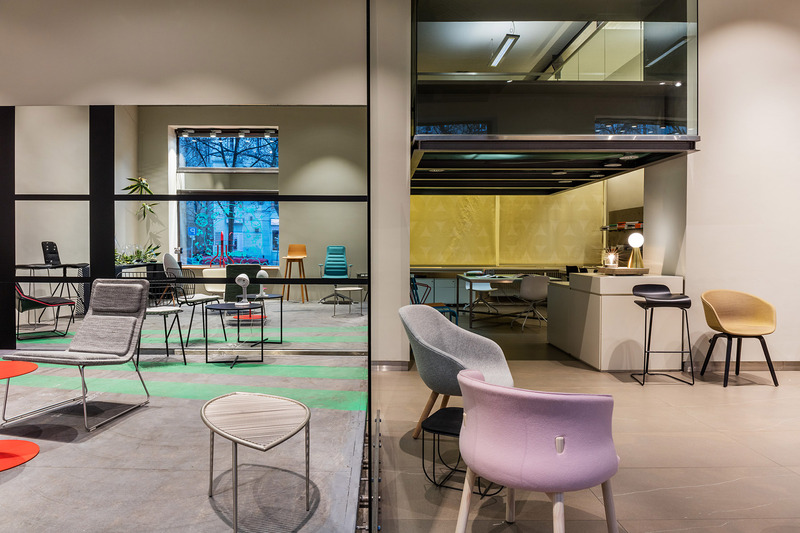 The ground floor serves as the main area for the concept store and as a community space, while the upper floor serves as the workspace of Dóra’s design team. 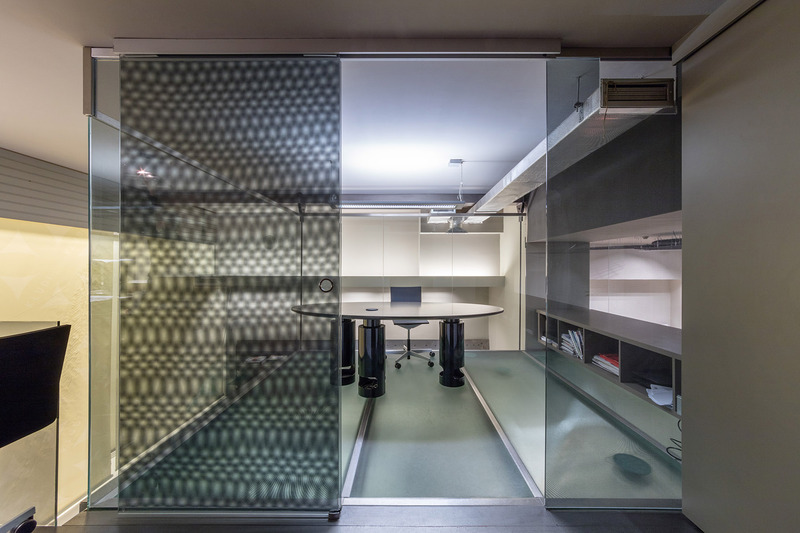 It also features a three-dimensional object in form of a tempered glass cube serving as a vantage point and the main office of the architect. The material selection was also influenced by architectural standards, as the space is defined by the interplay of MDF and glass surfaces, with several spatial objects designed as points of reference, like the aforementioned glass cube and the red spiral staircase leading up to it. The heart and soul of VITRIN is a diverse selection of seating options from design brands all around the world. 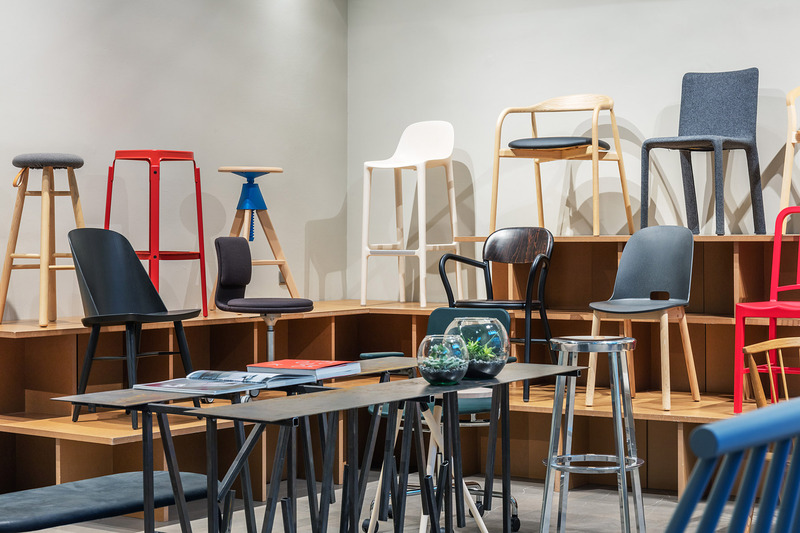 Italian mainstays like Cappellini and Magis are represented along with international newcomers like Mattiazzi, Menu and Viccarbe. Catering to a progressive crowd of design enthusiasts, all of the selected pieces possess something of note, be it an interesting form factor, a surprising character or a unique function. The right wing of the store features a modular “bleacher” platform, which holds the majority of dining and office chairs, while the opposite wing features a “podium”, where larger lounge chairs and office seating options are presented. A graphically segmented mirror wall lends some extra depth to the space, which is finished off by a freestanding glass sheet separating the two wings. 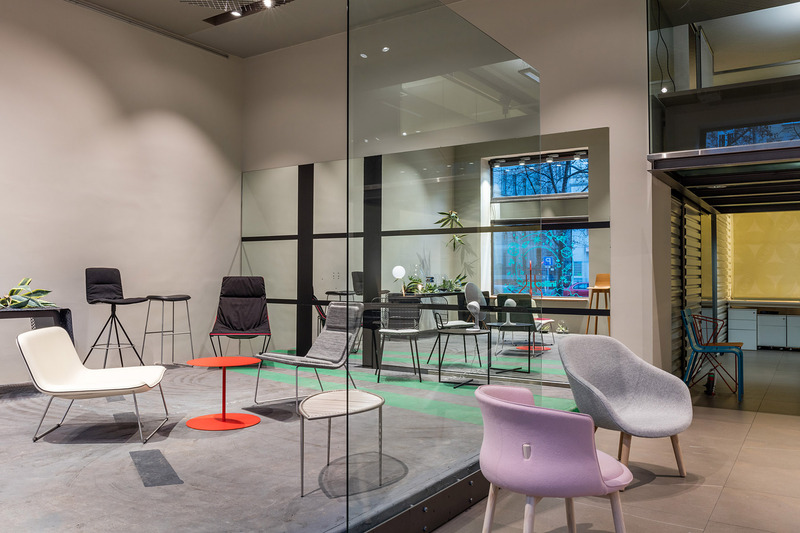 Being a concept store first and foremost, VITRIN aims to educate and inspire its design-conscious audience with an always changing exhibition space. The creative team behind the store frequently collaborates with other creators in and outside their field, like artisanal lighting workshop lumoconcept, or revered Budapest fashion brand Je Suis Belle. At VITRIN’s latest exhibition, a young Hungarian fashion designer by the name of Dóra Zsigmond takes center stage to show a world of relentless experimentation. 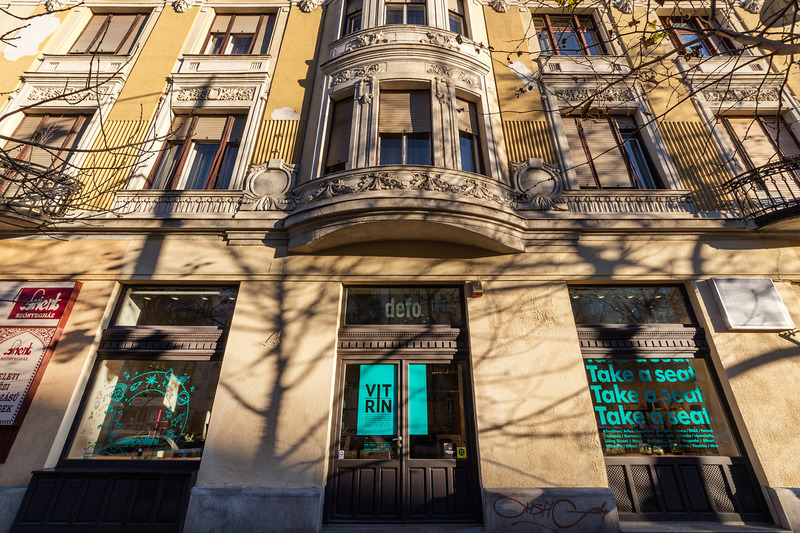 Visit VITRIN in Budapest, and check out their website and Instagram.